Xûr is in town offering new gear. What’s worth your hard-earned Strange Coins? 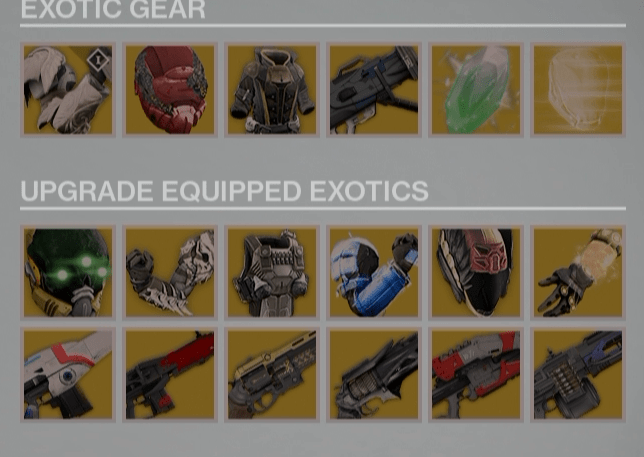 New stat rolls on Exotic upgrades! Test your luck with an Exotic Helm Engram! This weapon exemplifies everything good about rocket launchers, and seeks its targets aggressively, which is great when firing from longer ranges or moving targets. It recently got a buff, now having a magazine size of 3 instead of 2, though its tooltip still says 2. We have an entire review of this weapon which you can read here. Truth is going to serve you very well in the Crucible, as you’re basically guaranteed to never miss. If you’re in need of a Void-based Rocket Launcher it’s definitely a fine choice, but if not, save up for next weekend. Truth takes all of the good features of a rocket launcher (2 shots, tracking rounds, explosions on proximity, large blast radius, good velocity and reload) and puts them into one package. Is it worth using? Absolutely. It’s got excellent stats, with the best stability, blast radius, and reload speed of any rocket launcher. But if you’re short on Strange Coin, saving for a primary/special weapon that you’ll use more often, might be a better choice. Furthermore, a rocket launcher like Gjallarhorn would be better for the raid. Grenades and Horseshoes – Rockets will detonate early based on proximity to target. Prototype Trueseeker – Rounds will seek their targets aggressively. Ruin Wings are the new Dark Below Titan gauntlets, that are useful for either subclass. Special Weapon Loader – Increases the reload speed of all Special Weapons. Impact Induction – Causing damage with a melee reduces your grenade cooldown. Seeds of Ruin– Heavy ammo drops more often, and contains more ammo in each drop. These gauntlets are going to be a great choice for any Titan. 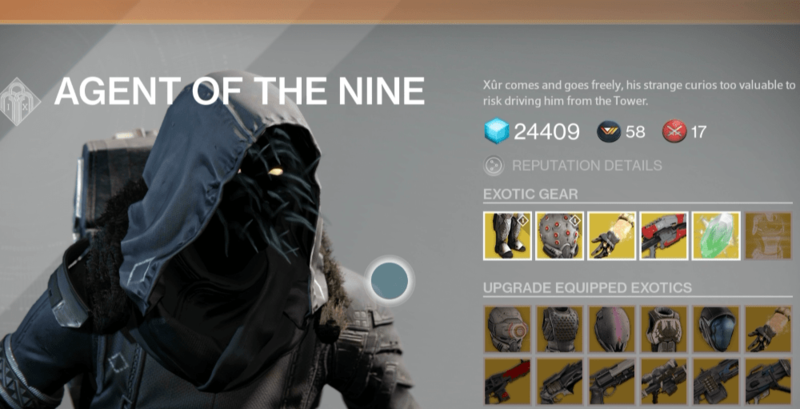 As with each of the Exotics Xûr is selling, these will help you to reach the required Light rating for level 31/32. The perks on these gauntlets are extremely useful as well, and work well together. 99/109 Strength + Impact Reduction are going to allow liberal use of your grenades. Also, the increased reload speed for Specials will be great for those who enjoy using shotguns/fusion rifles in the crucible. We recommend buying these, but also consider upgrading The Armamentarium if you have it. 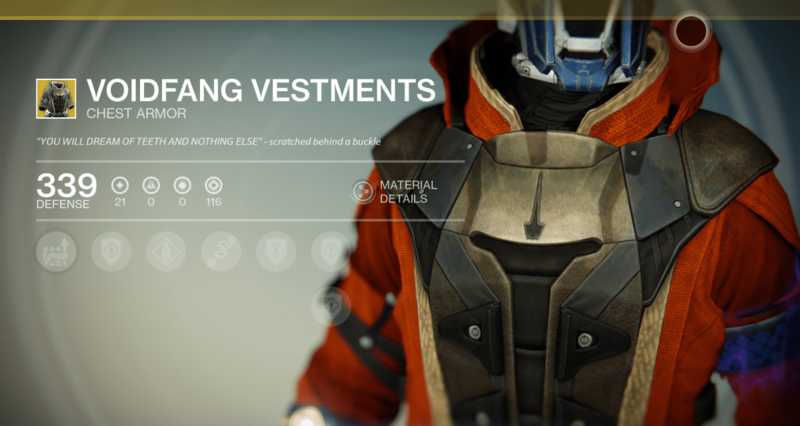 Warlocks currently have 3 Exotic chest options, and Voidfang Vestments is great for Voidwalkers who PvP a lot. Hand Cannon Ammo – Increases the amount of Hand Cannon ammunition you can carry. Special Weapon Ammo – Increases the amount of Special Weapon ammunition you can carry. Improved Axion Bolt – Your Axion Bolt grenade spawns an additional seeker. Respawn with full grenade energy. You probably already have this… it’s been sold so many times at this point, it’s getting beyond ridiculous. 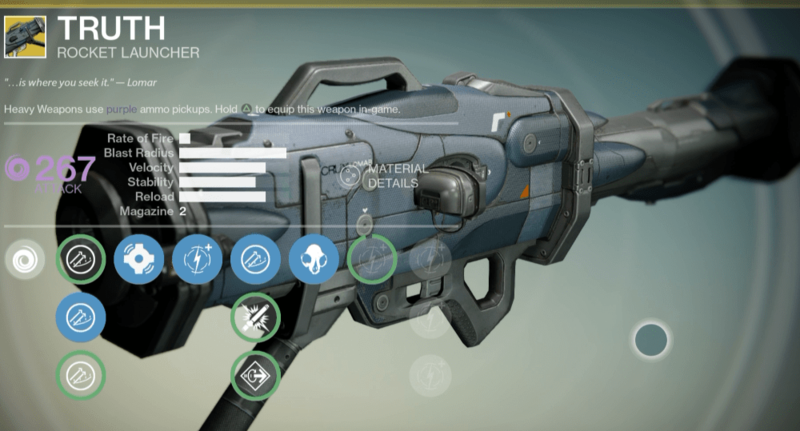 The Improved Axion Bolt perk will buff your grenades, which means more consistent kills. Add in the fact that you now spawn with grenade energy, and you turn into a grenade throwing nightmare for your enemies. This chest would work for the Sunsinger as well, because with the Gift of the Sun talent, it will spawn you with 2 grenades. It’s got 130/139 Strength, which is much is higher than what it’s been in the past. This is a good option if you’re a Voidwalker, especially if you use hand cannons, considering that Skull of Dire Ahamkara is basically the only other Voidwalker-specific armor piece right now. It’s going to be most useful in PvP, not so much in PvE. Along with spawning with full grenade energy, the Strength stat will reduce your melee cooldown time, making it an all around great choice. Buy a couple Exotic Engrams, and maybe you’ll get the new Obsidian Mind helm! 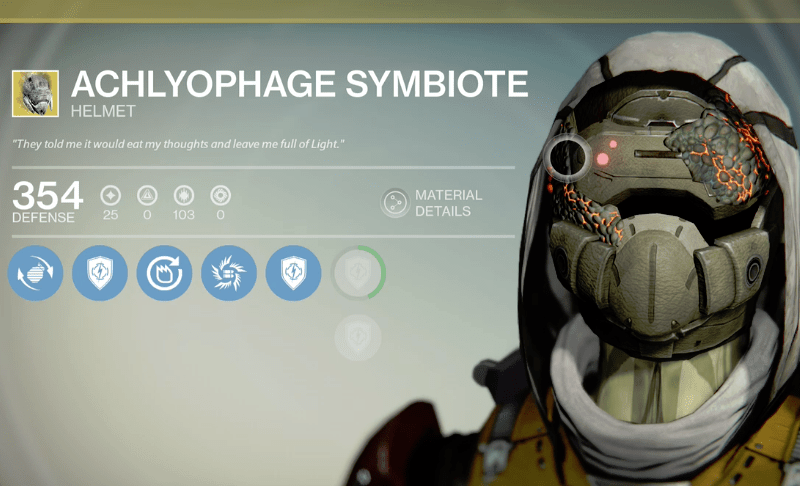 The Achlyophage Symbiote is a Gunslinger-specific helm, along with the new ATS/8 ARACHNID. It’s main feature is an extra shot for your Golden Gun, upped from 3 to 4. Fastball – Increases grenade throw distance. Ashes to Asset – Replenish Super energy when you kill an enemy with a grenade. Last Man Standing – Golden Gun gains one additional shot per use. Yes, although it certainly depends on how much you value the Golden Gun. An extra shot means an extra kill and Orbs of Light. It takes two shots to destroy a Defender’s shield, so the two remaining shots could vaporize multiple exposed Guardians. This week it’s got a 94/101 Discipline stat roll, allowing you to use your grenades more often. If you’re a Gunslinger without Exotic armor, this is definitely a good one to grab. However, seeing as you could also buy an Exotic Engram, maybe try your luck for the new ATS/8 ARACHNID? Wondering if the PS timed exclusives will get a chance to be upgraded? The answer is yes! Using the old PS date/time glitch, which apparently is buggy now, we were able to capture one of the inventories he’ll have. Timed PS exclusives confirmed to be upgrade possibilities! As you can see, he’s offering the Hawkmoon to be upgraded. Feel free to try this glitch yourself to see if it works for you, and let us know any more inventory possibilities you find out!